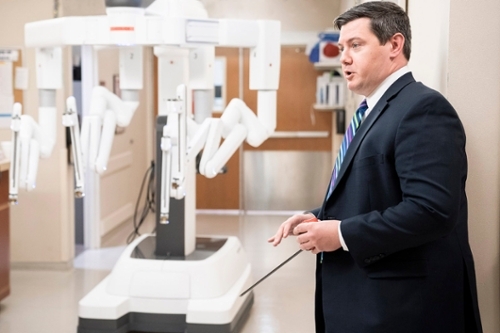 John Stringham, MD, discusses robotic thoracic surgery next to the da Vinci Surgical System. Patients needing thoracic surgery can benefit from a shorter hospital stay, less post-operative pain, a lower chance of complications, and a decreased risk of mortality with robotic surgery technology. Huntsman Cancer Institute (HCI) uses the Intuitive da Vinci® Surgical System for minimally invasive advanced lung, esophageal, and mediastinal resections. Stringham came to HCI from University of Virginia Health System in order to bring new thoracic surgery technologies to Utah and the region. HCI is the only hospital in the entire Mountain West region using the robotic Intuitive da Vinci® Surgical System for thoracic surgery. Stringham says HCI’s thoracic surgery team has a high level of expertise and experience treating rare cancers. Learn more about robotic thoracic surgery or refer a patient to HCI.